How to convert WMV files to MP4 or other formats so that it can be played on iPhone/iPad/Android devices without trouble? 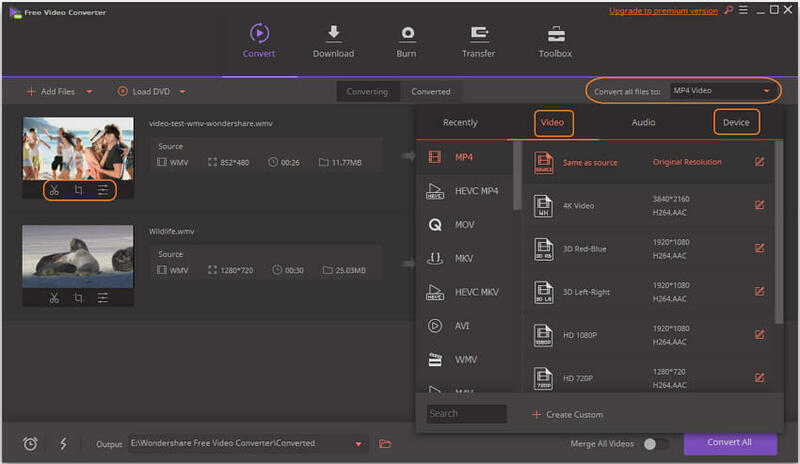 To explain in very simple terms, a video converter is a dedicated file converter with which you can convert to multi-video format (for example MPG, AVI, MOV, etc. to another format). If you have ever noticed yourself incapable of using a video in the particular way you wanted due to the reason that the format is not supported, then a video converter can be of some help! So, without waiting anymore let us jump into knowing more about the free WMV converter programs, both online and for Windows/Mac. WMV video format is created by Microsoft so you can play it on Windows computer smoothly. But it's not compatible with other devices such as Apple devices such as iPhone, iPad, iMovie, and more. In a word, it isn't a widely-used video format nowadays. For playing WMV files in more other devices, you can convert WMV to MP4, MOV, or other commonly used formats. Convert WMV to MP4 for using on almost all devices and websites. Change WMV format to MOV so that it can be played easily on Mac. 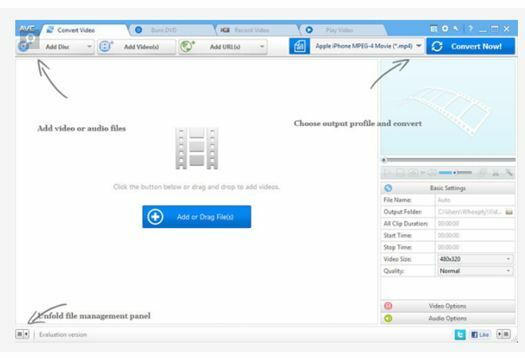 Save WMV to FLV or other smaller sized video formats to save space for your devices. Let's have a look at the top 10 free WMV converters to simply convert WMV videos free on Windows/Mac and online. 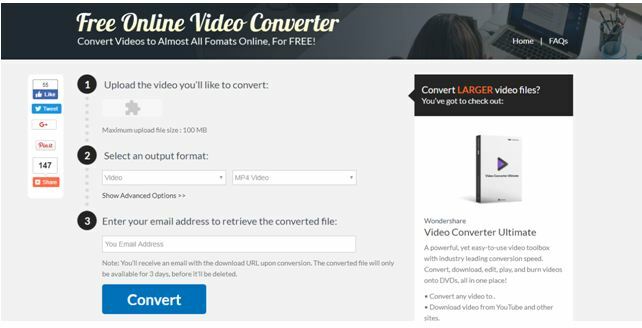 Wondershare Free Video Converter is the best free WMV converter for you to convert WMV videos to any format for free on Windows/Mac. It can convert multiple WMV files in batch with super fast speed and without losing quality. 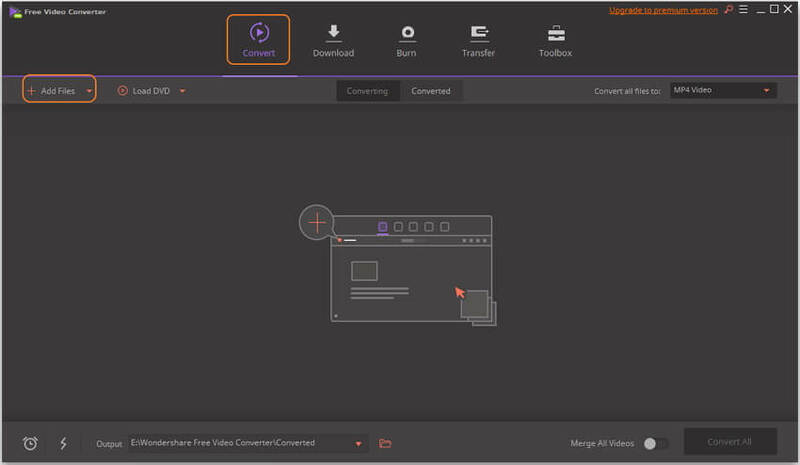 Wondershare free WMV converter also allows you to edit WMV files with real-time preview, including trimming, cropping, rotating videos, or adding watermarks, applying effects, and editing subtitles easily. Additional video-related functions such as CD/DVD burner, video compressor, video downloader, and others can also be found easily. Step 1: Download and install Wondershare Free Video Converter on your PC/Mac from the link above. Launch it and click the Add Files button under the Converted interface to add WMV files to convert. Step 2: Click the Convert all files to: option to open the drop-down format list, click the Video or Device tab and choose a format and resolution. You can also edit WMV files by clicking the edit icons under the video thumbnail. Step 3: Click the Convert All button to start converting WMV for free, and you can find the converted WMV files from the Converted tab. Pros: Free to use with multiple video conversion and editing functions. Cons: Slower than its ultimate version Wondershare UniConverter (originally Wondershare Video Converter Ultimate). 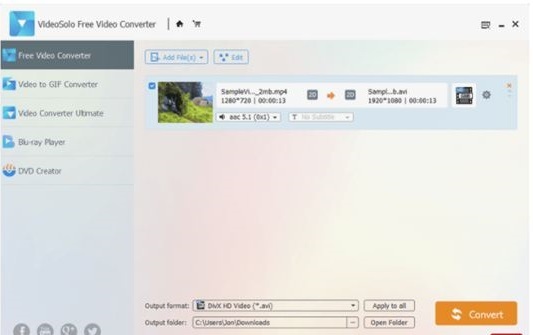 The first free WMV converter in our list is Any Video Converter. It is a very user-friendly video converter. There are many advanced options available for batch conversion, frame cropping, file merging, etc. Compatible with Windows 7,8,10, XP, Vista, 2000 etc. Tutorial: First click on Add video > choose output format > Select convert now. The output quality is outstanding, especially when paired with the fundamental editor that lets you trim, crop, and layer video effects for a more practical approach. The speed of conversion is a little slower here. The built-in DVD burner is a bit fussy. Freemake is one of the best WMV converter freeware available in the market. It not only supports numerous video formats but also allows you to download videos directly from social media platforms and various video-sharing sites! It supports many different devices, allowing rapid transfers. Tutorial: First step is to Add video>Then select output format> click convert. Pros: Freemake is regularly updated to fix problems and add new format options. Cons: You need the .NET Framework 4.0 Client Profile to successfully download the software. EncodeHD is a handy free WMV converter program which makes it quite easy converting files to readable formats. Here you will be required to open your video files then select the required device on which you want to play the converted file. Additionally, you can cut your converted files to 4GB short slices in order to fit them on DVDs. Pros: EncodeHD can easily convert your videos and do supports various formats and WMV converter freeware. Compatible with mainly Windows OS devices. It is a free WMV converter for MAC which is here to make you happy. It can convert bulk videos or individually, can merge your multiple videos and can support a wide range of your video file. Also, you can use this software to convert your video file to audio file. VideoSolo's converter supports themes too. Various options available like the 3D, video bitrate, resolution, aspect ratio, etc. This program can be installed on Windows XP through Windows 10, and on free WMV converter for MAC computers. Cons: It has large installer file. Another free WMV converter is the Free Video Converter which is a simple program to use. Advanced options are also available which allow you to merge files into one and burn videos directly on a DVD. You can also add subtitles and edit the video length. Tutorial: Upload files > Select output format > enter email address > Click convert. Pros: All modern Windows versions and free WMV converter for MAC are compatible with Free Video Converter, including Windows 10, 8, and 7 or before. Avidemux is a WMV converter freeware with many advanced and thorough features, one of which is video converting. You just have to load a video from the File menu to import it. Tutorial: Open file > add > video > Select output format > Click configure > save. All the advanced features like buffer size, interlacing, and threading can be seen in this program. It can be run on Windows (10, 8, 7, Vista, XP), Linux, MAC OS, free WMV converter for MAC, etc. Cons: The only thing negative about Avidemux is that it can be a bit confusing to convert videos. This program can convert videos in bulk or individually, and can merge multiple videos together. It supports a broad range of video file formats. This one also converts a video file to audio file. Themes are supported in VideoSolo's converter also. Tutorial: Choose source > Select file > Select output format > Click start > save. Cons: Converting time may exceed depends on file size. 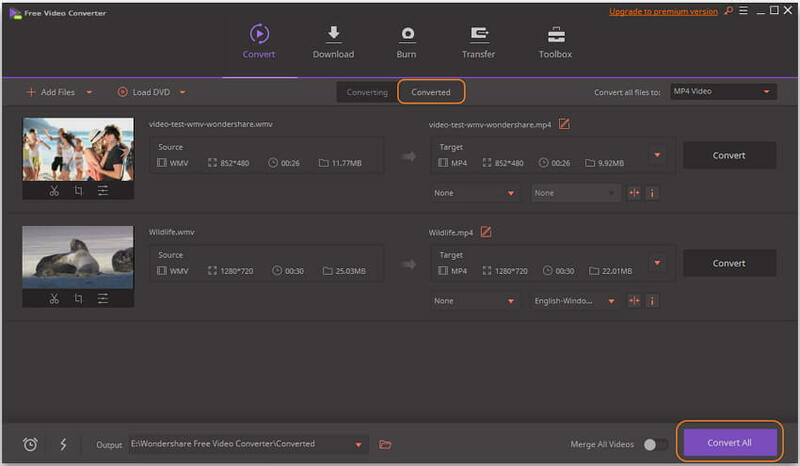 Clone2Go Free Video Converter has a great user interface that is quite quick in converting video files. The program is easy and operates quite well in WMV converter freeware. Pros: You can install and use Clone2Go Free Video Converter on Windows 10, 8, 7, Vista, or XP, etc. Cons: The minus point is that a popup window uses to get displayed during the conversion process asking you to install the Pro version. 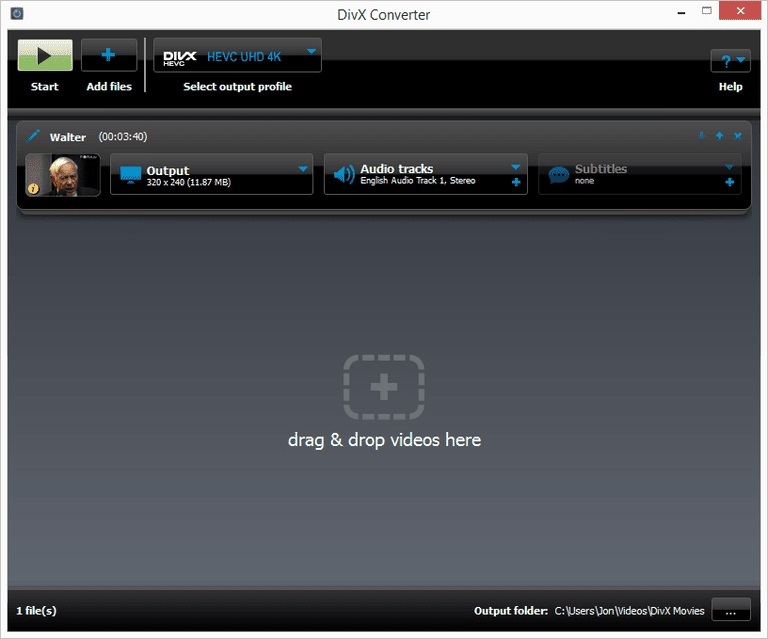 DivX Converter which is a free WMV converter for MAC which can convert videos to the 4K resolution, that is actually best suited for ultra HD screens. MPEG2 formats work well with DivX Converter, but not more than 15 days of trial period. Pros: The program is supported by MAC OS X and Windows. To use this program, you need to select the option called Enable DivX HEVC Plug-in during the setup, which isn't chosen by default. It tries to install some other allied programs which can be avoided by deselecting the options before you continue. That's all. Hope you have got a good idea about the best free WMV converters in this article. Try them for the best solution for an excellent quality picture.